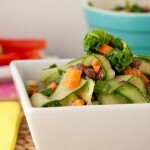 A low-fat tangy dill dressing smothers the kale and cucumber in this light and delicious salad. Rip kale into bite-sized pieces and steam for 45-60 seconds, just to soften. Drain if needed, and place in a large bowl. Add remaining prepped salad ingredients and stir to coat. 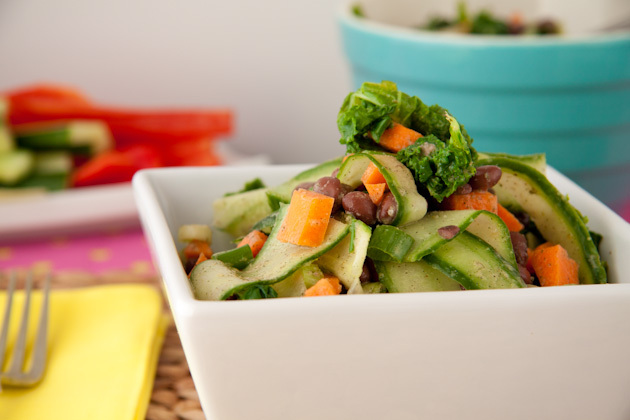 Store leftovers in the fridge in an airtight container for 1-2 days. The kale gets a bit wilted at the two day mark, but makes a great filling for sandwiches, wraps, or a topping to scrambled eggs!